A wedding of great interest to the district took place at Rushden on Monday, when Irchester and Rushden families were united. The contracting parties were Miss Kathleen Denton, third daughter of Mr. and Mrs. G. Denton, of "Eastfields," Rushden; and Mr. Frank Flintham Parsons, eldest son of Mr. and Mrs. E. Parsons, of Irchester. The bride is greatly interested in the work of the Queen-street Independent Wesleyan Church, and is a teacher in the Sunday School; and Mr. Parsons takes a large part in the social, public, and sporting life of Irchester: He is captain of the Fire Brigade, captain of the Football and Cricket Clubs, and treasurer of the War Savings Committee. The wedding was to have been a very quiet one, but with principals possessing such a wide circle of friends it was only to be expected that the ceremony should be very largely attended. If the old saying "Happy is the bride, whom the sun shines on" has any reliability, then the newly-wedded pair should be as we hope and believe they will beexceedingly happy. The morning looked anything but promising, but as they made the journey to and from the Independent Wesleyan Church, where the wedding was solemnised, the sun was radiant. The ceremony was performed by the Rev. C. J. Keeler, and appropriate music was played by Mrs. Reginald Denton. The hymns "The Voice that breathed o'er Eden" and "O Perfect Love'' were sung by the large attendance. The bride, who was given away by her father, looked very smart and charming in a pale fawn costume, and wore a Georgette hat, lined in shell pink and trimmed with ospreys. Owing to the war there were no bridesmaids, but Miss Doreen Denton, sister of the bride, and Miss Jessie Cave, acted as attendants. The best man's duties were efficiently carried out by the groom's cousin, Mr. Gordon Parsons, of Irchester. The wedding guests included just the relations of the bride and bridegroom, and it was extremely fortunate that two of the bride's brothers, Lieuts. "Jack" and "Don" Denton were able to get special leave to attend the ceremony. The brothers H. G. Denton, of the M.T., A.S.C., is in France, and Lieut. W. H. Denton was unable to get leave. After the reception the happy couple left by motor for London, where the honeymoon will be spent. 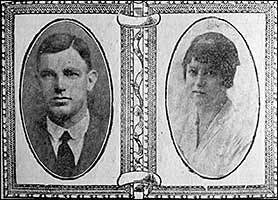 Mr. and Mrs. Frank Parsons will reside at "Northfield," Irchester. The presents were numerous and very beautiful.